Home Yeh Rishta Kya kahlata Hai Yeh Rishta Kya Kahlata Hai 16th July Episode Written Update "Kartik Leaves Naira and Mumbai "
Yeh Rishta Kya Kahlata Hai 16th July Episode Written Update "Kartik Leaves Naira and Mumbai "
In the previous episode we saw that Naira and Kartik both signed the divorce papers.So in today's episode Suwarna is discharged from hospital.She is in her room and everyone is near her. Kartik asks everyone to leave as he can take care of her.But Manish denies and order him to leave and let him stay near Suwarna.Daadi took Kartik with him. Suwarna says to Manish that she doesn't want to talk anything.Manish replies that he shouldn't talk anything to her as if any of his words will hurt Suwarna she may hurt herself again.He says that he thought that after Shubham's death she must have realised that how it feels when our dear one passes away. How difficult it is for their near ones.But she didn't.She denied to meet in hospital and to talk at home.If you disagree at some points discuss it.But she stopped talking to him, meeting to him and just ended the relation.If she really wants to do so he may leave her alone and she can live with his son.But he requests him if she really loves Kartik so she will not add fuel to fire.because if it will happen next time he will be the one in the car. Naira is crying sitting alone.and on other side Kartik is too restless. Naitik went to Naira and said that Daughtersay grow up but fathers can't give up on worrying for them.She can be upset with him but can't leave h alone.Whether they both agree or disagree with each other.Naira says sorry and explains that it's the best step for everyone's happiness.If she had told him he hadn't understood her.Naitik says that may be he can't understand as only a person's heart know what is right and what is wrong.But he knows people don't cry after right decisions but the sleep with relief. Naira records an audio saying that she took this decision not for herself but for everyone but still her heart is restless.She is under doubt whether her decision is right or wrong.She dont know why she is regretting.She hadn't feel this much pain in even those 2 years.She thinks to delete the audio but by mistake sent it instead.She saw that Kartik had seen the message. Naira comes out from the room and found Kartik in front of her .He says that he would never be apart from her doesn't matter how hard she may try.2 years are nothing he will not accept the divorce even after 200 years.Naira hugs him but soon realised that it was just an illusion. Just as Naira went inside.Kartik reached there.He saw the message by Naira.But didn't listen the audio as he thought it may hurt him even more.Delete the message and went back. Next morning Naira and Kartik both faces each other.Naira sees herself by Kartik who is signing her to talk to him, apologize and hug him hard.But Naira kept standing. Kartik too faced the same illusion as he is saying to himself to talk to Naira once.But none of them talked.As Kartik left Naira asks Kishore about Suwarna's health and if their whole family is going back.But daadi reaches there and asked her why she broke their hopes.Did she waited for 2 years to hurt Kartik.She didn't expected this from her.She didn't even let Naira speak any single word and left. As daadi went in Surekha asks Daadi why she is angry.Daadi told her that she met Naira and couldn't control herself and scolded her that why she brought up matter of divorce.Surekha remembered what Naira talked to her when she was in hospital. Naira talks to herself that she should meet Kartik for the last time.On the other side Suwarna decide to talk to Naira once. Naira is at the door and on the other side is Suwarna.Naira later gave up on her decision to talk to Kartik as she didn't had enough courage.On the other side when Suwarna was about to ring Naira's bell Kartik came there and asked her not to talk to anyone as everyone has their right to take their own decisions.As they left Naira comes out. 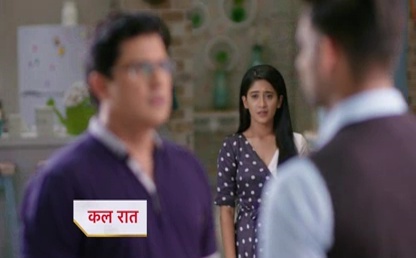 Kittu reaches there and asks Naira why didn't she stopped her friend Kartik.She requests Naira to join her as she is going to say bye to Kartik.But naira denies. Kittu went to Kartik and asked him why is he going.and will he miss Naira.but Kartik simply says bye kittu.and get into car. Naira realised that she must talk to Kartik for the last time and rushed down.But she's late as they have left.She wanted to stop them but can't. Naitik asks Naksh why he didn't told him that he was taking help from Manish.Naksh replies that he couldn't as he always worried only for Naira.Naira thinks that Naksh is facing these difficulties because of her and she must do something.